When just a normal day in South Florida already feels warm enough with its high humidity and temperatures in the mid-80s, it doesn't take much for conditions to change from uncomfortable to intolerable. So it was on this MBWeek when the highs every day were above average: our "coolest" day had 87 for a high, eight of our 11 days saw 90+ temperatures, and it officially hit 94 on one of these days. Our most successful birding experiences included Harnes Marsh (our closest Snail Kite on Day 1 and our first Limpkins on Day 3), Cape Coral (scrub-jays, Burrowing Owls, and Monk Parakeets), Bunche Beach's shorebirds, the cuckoo spot on Sanibel Blvd, the Sheppard Rd/Venus Flatwoods/Hwy 731 route (for Bachman's Sparrow and Short-tailed Hawk, after we had nearly given up on both), Green Cay and Wakodahatchee Wetlands (swamphens, gallinules, and lots more), the nearly simultaneous orioles and bulbuls at Kendalwood, the White-winged Parakeet neighborhood near the airport, our quite unexpected luck by being included on the overbooked flamingo tour (cancellations followed news of the outhouse removal! ), and certainly our trip to Garden Key via the Yankee Freedom III. 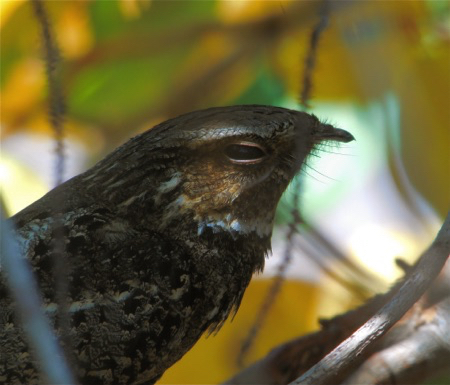 About the only bird we tried for that eluded us was the uncooperative Bahama Mockingbird skulking somewhere in the Key West Botanical Gardens. Seen by many on Friday and Saturday, it failed to appear for us or anyone else on Sunday. It apparently reappeared on Monday when we were in the Dry Tortugas, but on Tuesday morning we were among several birders who again came up empty. 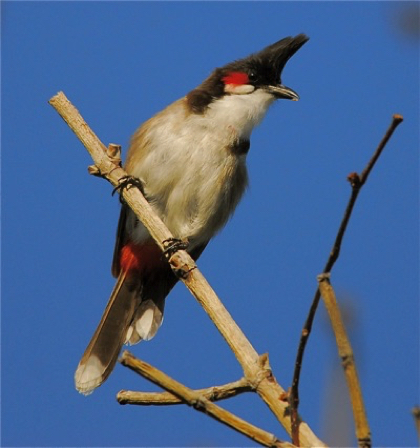 In all, we came up with no fewer than 188 species, which compares to the 172 we had on this MBW in April 2011. In addition, there were five other "non-countable" exotics (in brackets below) that might well become ABA-legal in the near future. After all, if Florida birders list those homely black-and-white muscovys waddling across the park, why not count the Red Junglefowl that have roamed the streets of Key West for 200 years? 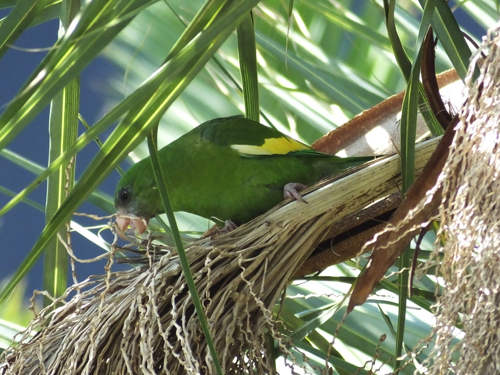 April 19 - Arrival at RSW at 12:30pm; afternoon at Harnes Marsh and first Nanday Parakeet search; dinner at Johnny Molloy's and first of 3 nights in Bonita Springs. April 20 - Babcock-Webb WMA, Cape Coral scrub-jay/owl/parakeet areas, successful Nanday Parakeet search, and briefly at John Morris Rd/Bunche Beach; dinner at Pincher's Crab Shack. April 21 - Return to John Morris Rd/Bunche Beach; Sanibel Blvd cuckoo spot, Sanibel lighthouse, Carlos Point, and Eagle Lakes in Naples; dinner at Naple's Ale House. 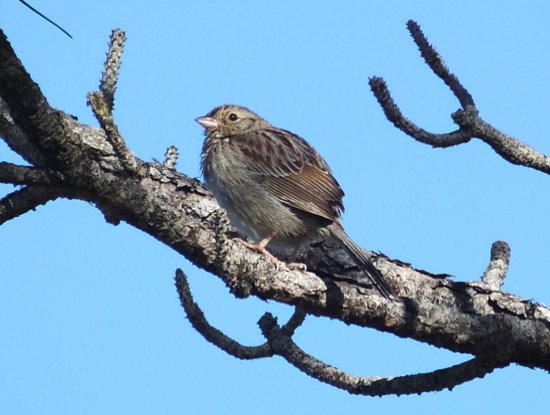 April 22 - Return to Harnes Marsh, Bachman's Sparrow search in Lehigh Acres, La Belle, Keri Road loop, Fisheating Creek/Rainy Slough/Sheppard Rd/Venus Flatwoods/Hwy 731 loop, and Okeechobee public access; dinner at Flannigan's and night in Stuart. April 23 - Green Cay, Wakodahatchee Wetlands, Spanish River Park, and drive to Florida City via Cutler Ridge swallow bridge and wetlands; dinner at Capri and first of 3 nights in Florida City. April 24 - Morning at Kendalwood oriole/bulbul neighborhood, Matheson Hammock, and first White-w Parakeet search; afternoon/evening in Everglades, especially at Flamingo's cowbird sanctuary, the Seaside Sparrow marsh, and the Chuck-will's-widows/alleged "picnic dinner" at Long Pine Key. 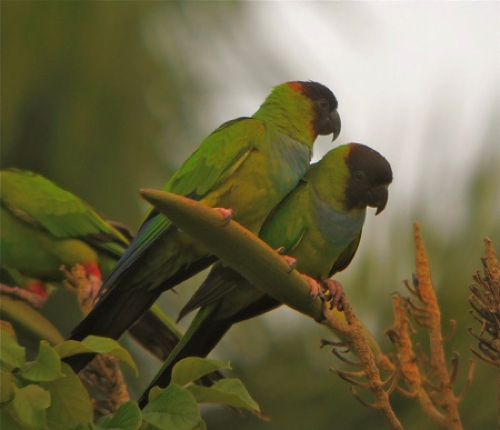 April 25 - Successful return to Ocean Bank's White-winged Parakeet neighborhood, flamingo tour at STA-2 area; dinner at Capri and evening Lucky Hammock/Chuck-will's-widow option. April 26 - Card Sound Rd, Key Largo Botanical State Park & vicinity, Marathon, and Key West Botanical Gardens mockingbird search; dinner at Mangia Mangia and first of 2 nights in Key West. April 27 - Garden Key in Dry Tortugas National Park via Yankee Freedom ferry, and Marathon airport nighthawks; "dinner" at McDonald's/KFC. April 28 - Unsuccessful return to Key West Botanical Gardens, Ohio Key, Big Cypress Oasis Visitors Center and Loop Road; dinner at Iguana Mia and night in Fort Myers. April 29 - Final morning mostly at Sanibel lighthouse and NWR Bailey Tract; afternoon departures for home from RSW. The overall weather on this South Florida MBWeek was pleasant, with only one day above 95 degrees and the first part of trip being cool enough for jackets for most of a day. The nice weather also showed in the lack of migration for most of the trip, as our only day with a good number and variety of migrants was on our trip to the Dry Tortugas, where we had 18 species of warbler and 4 thrush species on Garden Key. 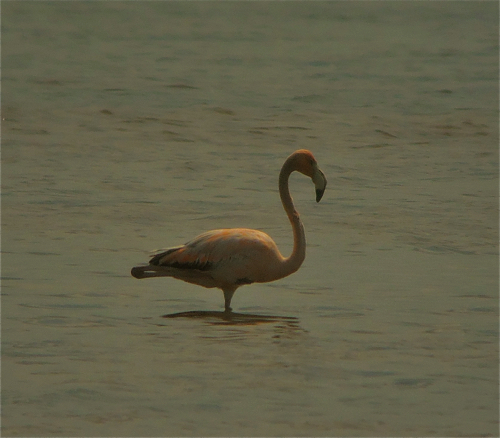 Many of the key birds were difficult to find, but we did prevail on all but a few. Limpkins were observed at Harns Marsh, as well as an immature Snail Kite. 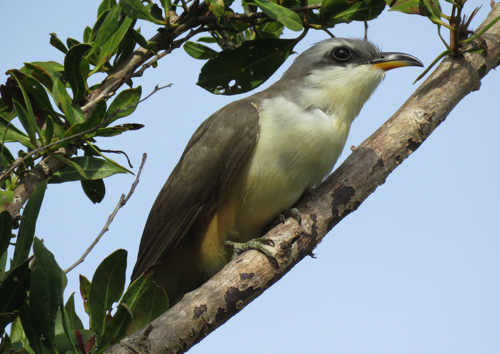 We were successful on our second trip to Black Point Park, getting close looks at Mangrove Cuckoo. At Babcock-Webb we enjoyed long looks at the resident Red-cockaded Woodpeckers, Brown-headed Nuthatches, and Bachman's Sparrows. 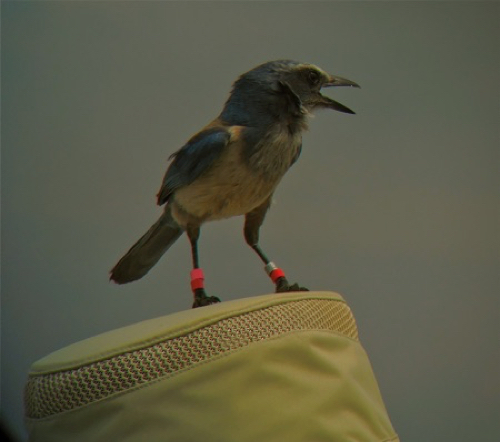 The Florida Scrub-Jays were cooperative, landing on our vehicles before we could get out and then giving everyone a chance for close encounters. 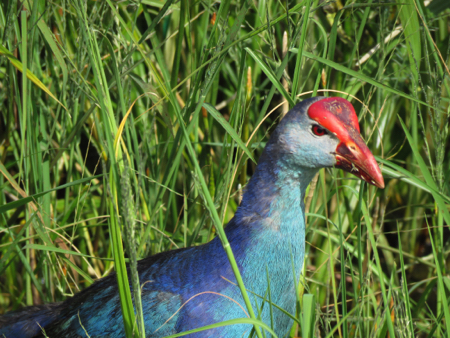 We found baby Muscovy Ducks, Egyptian Geese, and Purple Swamphens, a female Spot-breasted Oriole on a nest, and many of the other species observed were singing on territory. 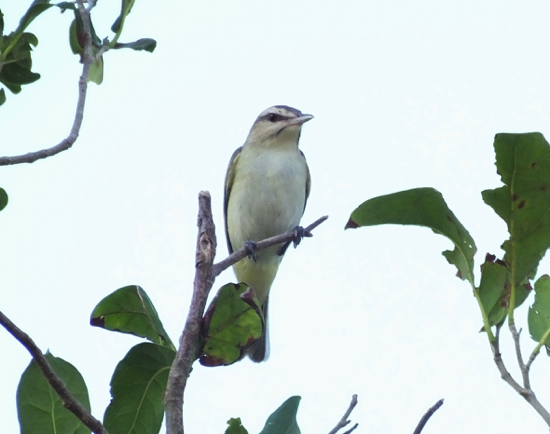 There were several vagrants to chase on this trip, with the first-North-American-record Cuban Vireo being the most interesting. The bird was at Fort Zachary State Park on Key West from the 19th to the 24th, and we had the good fortune to arrive at the park on the 24th! 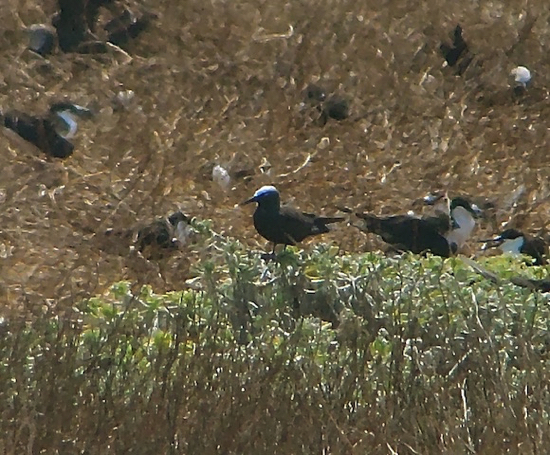 We were also able to relocate the first Pacific Golden-Plover ever recorded in Florida and the pair of Smooth-billed Anis nesting at Loxahatchee NWR. But we did miss the Thick-billed Vireo, which had been observed at John U Lloyd State Park, and the Zenaida Dove remained out of sight during our visit when it was presumably sitting on a nest with its Mourning Dove mate in attendance. Our boat trip to and from the Dry Tortugas unfortunately had no Audubon's Shearwaters or Bridled Terns, although the captain of the boat did slowly pass by Hospital Key so we were able to see the Masked Boobies which nest there along with a loafing Brown Booby. But while not much was on the water, we made up for it on land at Garden Key. 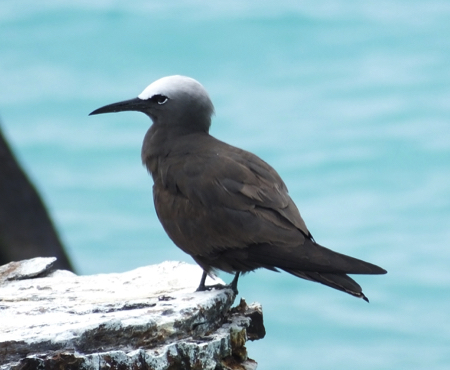 The recently reported Black Noddy was seen well through our spotting scopes, and our last-minute looks at the roosting Chuck-will's-widow was certainly a highlight for many of us as well. We observed 181 species in all for the trip, plus we had a few other "non-countable" species which may require another Florida trip if the ABA considers them countable in the future. Both Herb & Noel observed their 600th ABA-area species, it was Diana's first trip to Florida and she had the most life birds (48), while Don observed the fewest (5) since he had birded in Florida before. 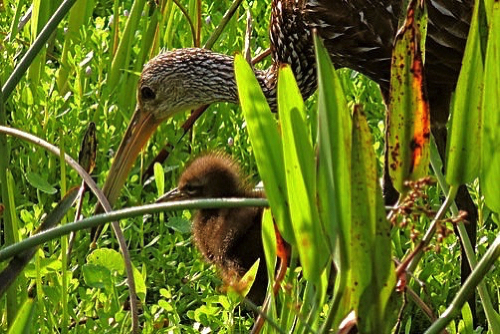 And I finally found my lifer Limpkin – and enjoyed all of the "Eye-talian" restaurants! April 17 - Arrival at RSW at 11:30 am for most of the group; afternoon at Harnes Marsh, plus Muscovy Ducks and Nanday Parakeets at Manor Park; dinner at Two Meatballs in the Kitchen and the first of 3 nights in Fort Myers. April 18 - Babcock-Webb WMA, Cape Coral Scrub-Jay/Burrowing Owl/Monk Parakeet areas, and our first stop at Bunche Beach; dinner at Pincher's Crab Shack. April 19 - Sanibel Island, Ding Darling NWR wildlife drive & Bailey unit, Eagle Lakes Park, and Tiger Tail Beach; dinner at La Grotta Italian Grill. April 20 - Return to Bunche Beach and Harnes Marsh, La Belle area, Six Mile Bend Sod Farm near Belle Glade, and John U Lloyd State Park; dinner at Zara Jazz Café and night in West Palm Beach. 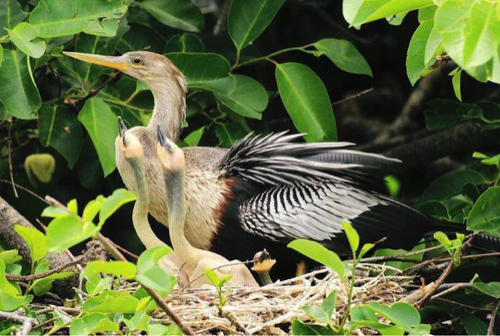 April 21 - Loxahatchee NWR, Green Cay, Wakodahatchee Wetlands, Cutler Ridge Cave Swallow spot, Black Point Park & Marina, and drive to Florida City; dinner at Capri and first of 3 nights in Florida City. 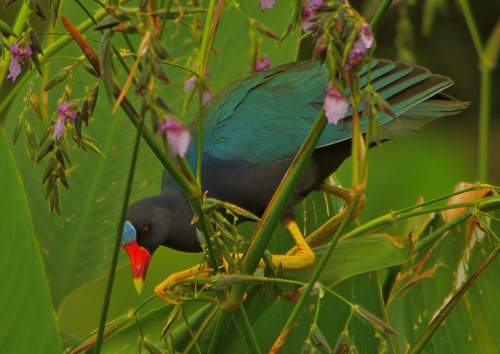 April 22 - Return to Black Point Park & Marina for Mangrove Cuckoo, city views atop the Ocean Bank & brief fly-by of White-winged Parakeets, Fuchs Park, Kendall neighborhood, afternoon at Everglades National Park, incl. Shiny Cowbird and Manatees at Flamingo; dinner at Bangkok Cuisine Thai Restaurant. 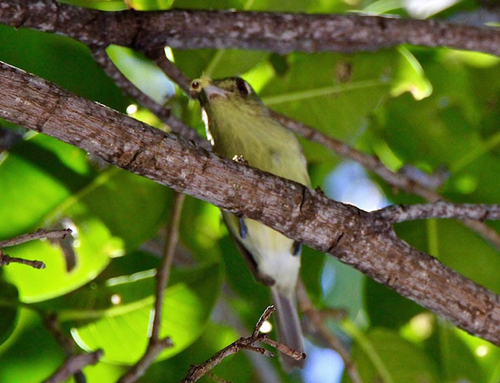 April 23 - Return to John U Lloyd State Park for second unsuccessful Thick-billed Vireo try, Markham Park, Key Biscayne, successful second trip for White-winged Parakeets at Ocean Bank, and Brewer Park; dinner at Applebee's (!). April 24 - Card Sound Road, Key Largo Botanical State Park & vicinity, Marathon Government Center, and Fort Zachary's Cuban Vireo; dinner at the Stoned Crab and first of two nights in Key West. 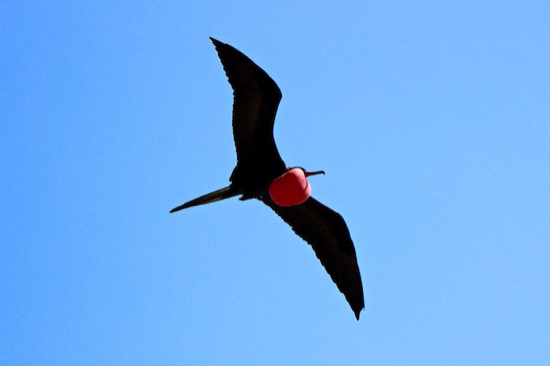 April 25 - Garden Key in Dry Tortugas National Park via Yankee Freedom Ferry, and Marathon Airport nighthawks; dinner at Mangia Mangia. April 26 - Return to Marathon Government Center, Long Key State Park, Wildlife Rehab Center, Shark Valley, and drive to Fort Myers; dinner at Two Meatballs in the Kitchen and night in Fort Myers. April 27 - Final morning at Six Mile Cypress Slough and return to Bunche Beach; afternoon departures for home from RWS. While the warm and sunny weather was enjoyable for birding, it did little to bring in any vagrants or migrants. 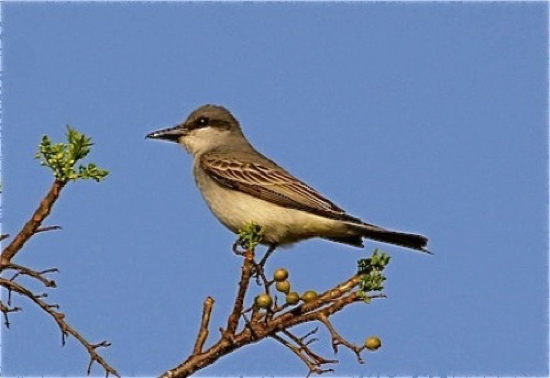 The only good day for migrants was on the first day of the MBWeek, April 16, when most – but not all – of the group experienced a good fall-out of warblers on Sanibel Island. (The remaining few participants had been treated to over a foot of snow and delayed flights back in Minnesota, unable to make to Florida until late afternoon of the 16th, thus missing this fall-out.) But we did all finally arrive and were back on schedule on the second day of the tour. At Babcock-Webb WMA the Red-cockaded Woodpeckers were still in their usual location, but they were less than cooperative, with only a few of the participants getting a good look. On the other hand, the Brown-headed Nuthatches and Bachman's Sparrows were more obliging, and we were able to hear and see both species up close. Later in the afternoon we went to the Cape Coral Florida Scrub-Jay location and were able to see five of these jays along with some Burrowing Owls. 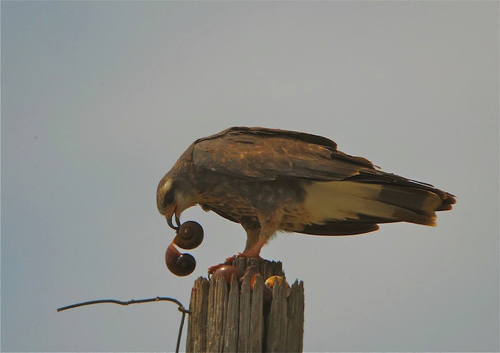 The Monk and Nanday parakeets were also easy to find, so we had time to visit Harns Marsh where a Snail Kite was observed along the canal near the park. 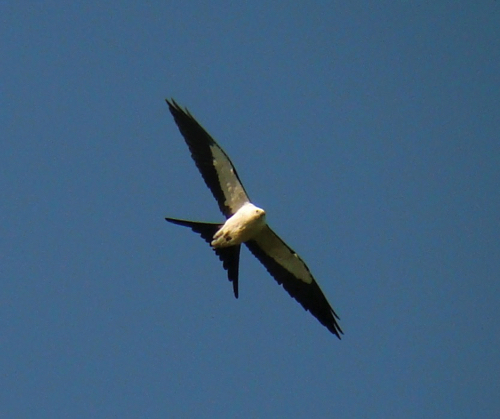 We got some great looks at the bird and watched it flying for several minutes. And, I kept my winning streak intact by seeing Limpkins (my former jinx bird!) at Harns Marsh for the second trip in a row. From Tigertail Beach (a few shorebirds and nice looks at Yellow-billed Cuckoo and Blue Grosbeak), we headed to West Palm Beach, searching around Immokalee and La Porte for the elusive Short-tailed Hawk en route. Just as we were about to give up, we spotted a Short-tailed in flight over Highway 27 just east of the town of La Porte. 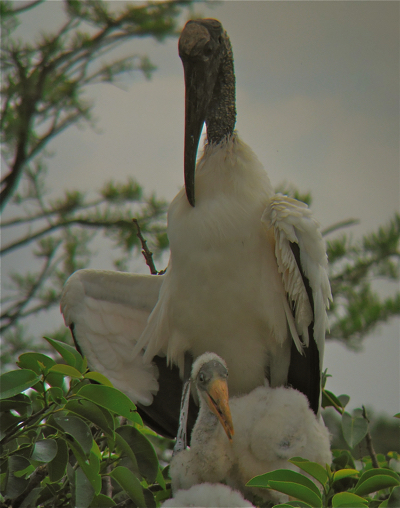 On our next day of birding in the West Palm Beach area, there were lots of nesting Wood Storks at Wakodahatchee Wetlands and some Northern Gannets at Boynton Inlet. We also picked up Cave Swallows at their traditional location on our way to Florida City. 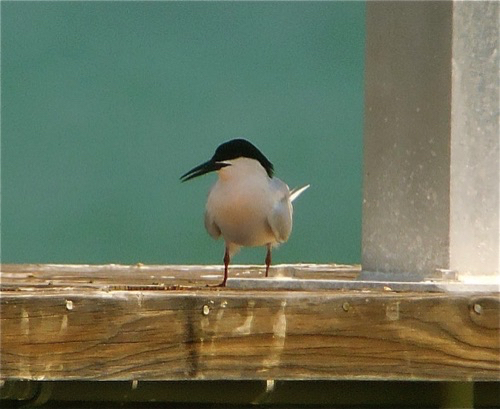 On our drive down to Key West, Black-whiskered Vireos were seen at Card Sound, but the Roseate Terns had not returned to their nesting site at the Marathon Government Center. 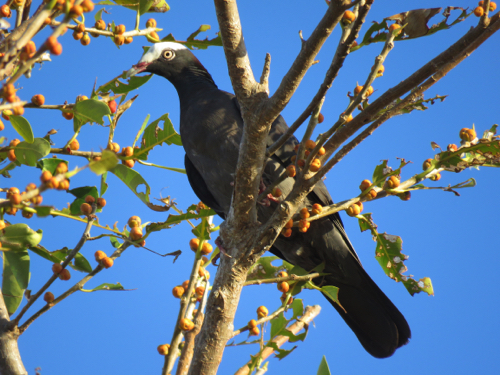 We also stopped at a number of locations searching for White-crowned Pigeons, only to discover after dinner there were dozens of them on Stock Island. 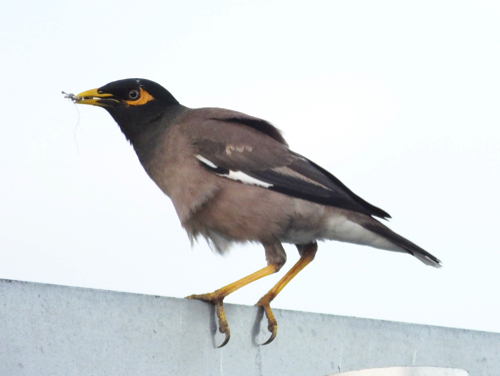 It was interesting to watch as they fed on some fruiting trees close to the road. We enjoyed a pleasant day on our trip to Garden Key in the Dry Tortugas. 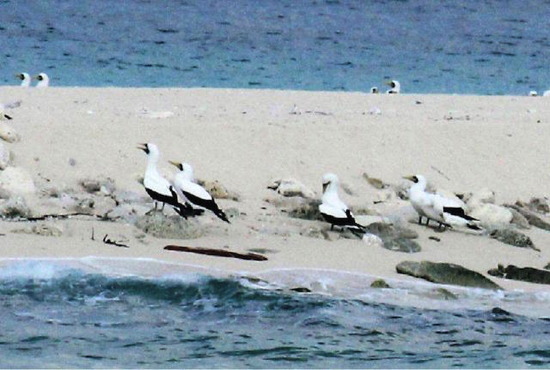 Our boat trip gave us the usual pass by Hospital Key so we were able to see the Masked Boobys nesting there. 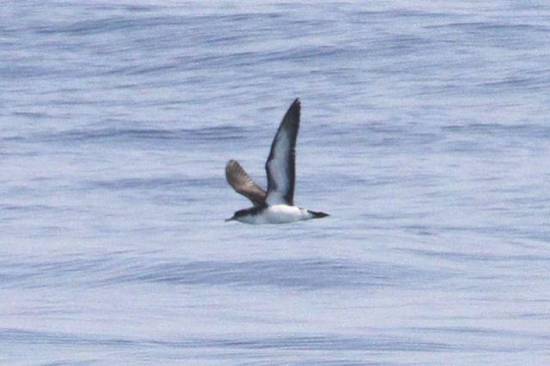 En route there were also a few Northern Gannets, Magnificent Frigatebirds, and some probable Roseate Terns. 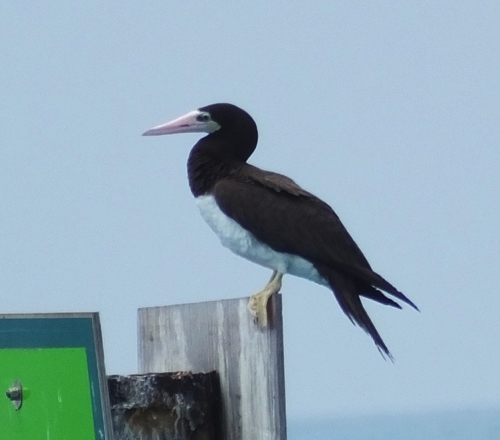 At Fort Jefferson itself we had a very good look at a Brown Booby and a Short-eared Owl (of the Antillean subspecies?). On the coal docks there were lots of Brown Noddys, but the hoped-for Black Noddy was a no-show that day for us and the other birders present. 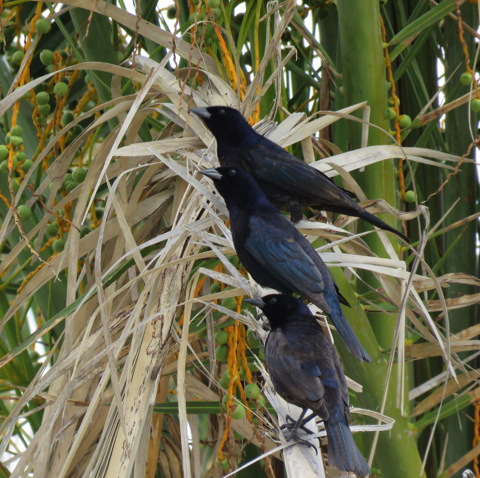 But there were Shiny Cowbirds by the fort and a nice mix of warblers (22 species in all on the MBWeek) inside. April 15 - Most of the group was able to arrive in Fort Myers today (first of three nights in Fort Myers). April 16 - Sanibel Island-Lighthouse Point, Bunche Beach, Harns Marsh, and Six Mile Cypress Slough (dinner at La Grotta Italian Grill). 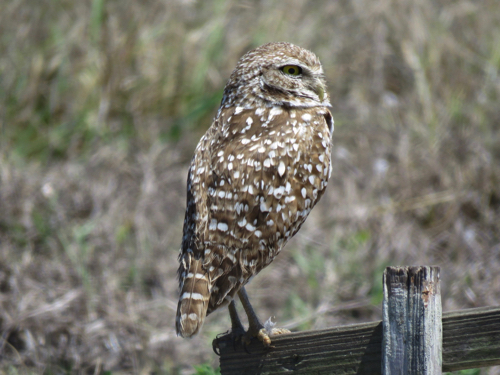 April 17 - Babcock-Webb WMA, Cape Coral's scrub-jay / Burrowing Owl / parakeet areas, and Harns Marsh (dinner at Two Meatballs in the Kitchen). April 18 - Fred Coyle Park and Tigertail Beach in the morning; afternoon drive to the East Coast via a Short-tailed Hawk just east of La Porte (dinner at Torero's Restaurant; night in Palm Beach Gardens). April 19 - Loxahatchee NWR, Green Cay, Wakodahatchee Wetlands, Cutler Ridge Cave Swallow site, and Ocean Inlet Park (dinner at Bangkok Restaurant; first of three nights in Florida City). April 20 - Black Rock Point Park & Marina for Mangrove Cuckoo, Ocean Bank for White-winged Parakeets, Bill Baggs State Park, and Kendall (dinner at Applebee's!). 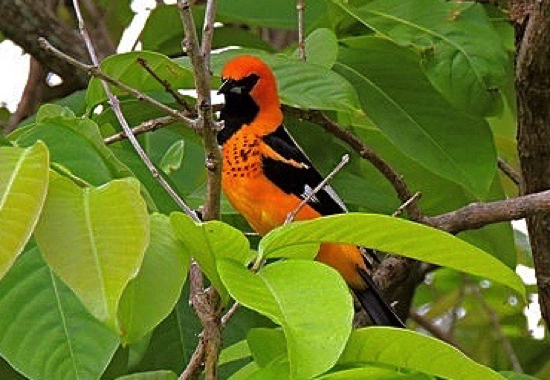 April 21 - Return to Black Rock Point Park & Marina, Brews Park, Kendall and North Miami for bulbuls and orioles, and Cutler Wetlands (dinner at Sonny's BBQ / Capri Restaurant). April 22 - Card Sound Road, Key Largo Botanical State Park & vicinity, Marathon Government Center, and Fort Zachary in Key West (dinner at Hogfish Restaurant; first of two nights in Key West). 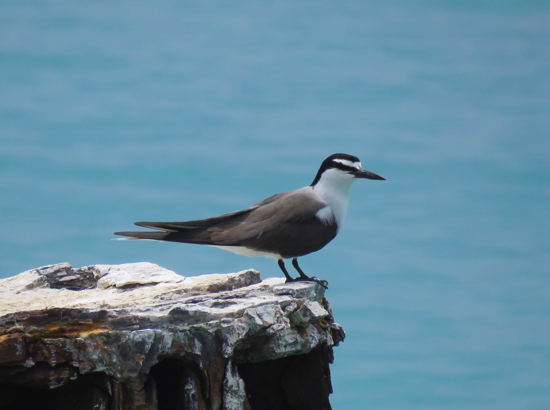 April 23 - Boat trip to Garden Key in Dry Tortugas National Park via the Yankee Freedom, and evening Marathon Airport nighthawk search after our return. April 24 - Return trip to Fort Myers via Marathon Government Center, Wildlife Rehab Center, Shark Valley section of the Everglades, and Eagle Lakes Community Park in Naples (dinner at La Grotta Italian Grille and night in Fort Myers). April 25 - Bunche Beach and some small Fort Myers parks on our final morning; afternoon departures for home.